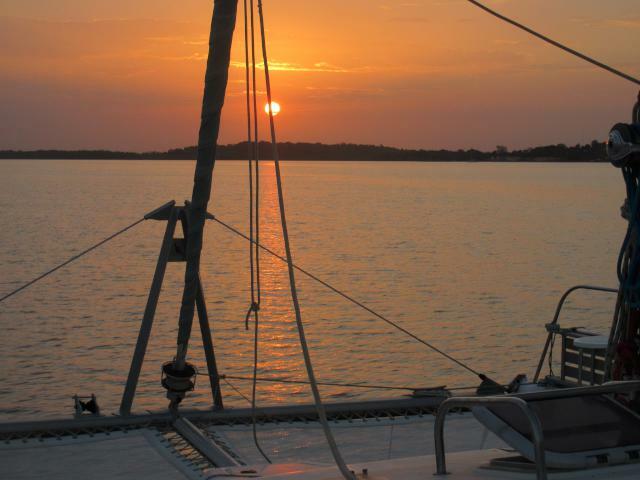 « Older: Cruising Dakar and Senegal – Do We Have Stories to Tell! Current Position: 13 36.28 N 014 58.65 W Click to view map. Banjul is a delightful contrast to Dakar. It might be the capital of this tiny country with its 1.8 million inhabitants, but it feels more like an over-grown African village. There are no high rises. in fact, there are barely any big buildings. Like all the villages, the roads are packed dirt, the stores are just large stalls, and the traffic is light. In fact, most of the traffic consists of big trucks that are delivering or picking up supplies for onward distribution. Banjul is, after all, a container port that receives about one container ship per day, plus the occasional cruise ship. Having completed half of our check-in when we arrived on the Friday afternoon, we then had the weekend free until we could get our cruising permit on the Monday. On Saturday morning we moved from Banul up a shallow creek to Lamin Lodge, a sheltered anchorage and the site of a ramshackle establishment, run by an ancient German, that serves surprisingly good food. We were entertained during our lunch their by overhearing an English dad explain to his sons why one should never spend less than 900 pounds to get a decent pair of binoculars and, if you can, you should really spring for the ones at 2,500 pounds to get the really good ones. Hmm. How will we ever manage with our Bushnells? For Gambia is the paradise for twitchers. Don’t come here for the scenery. There are no mountains. Or even hills. The country is one big mangrove swamp that merges into freshwater wetlands. Rice is a popular crop, grown, like in China, in paddy fields that are flooded by the freshwater tides. But it does have birds. Now, don’t ask me what kind of birds they are. What I do know is that you hear a lot of them. And you see them. There are certainly eagles, hawks, vultures, kingfishers, egrets, herons, flamingoes, pelicans, and countless others of different shapes and sizes whose names I have no idea. But I digress. We are in Lamin Lodge, learning about the inadequacies of our Bushnells binoculars, but enjoying a nice meal and a cold beer. And a nice cooling breeze. Afterwards we walked around the Lodge locally and met some of the monkeys that are attracted there by the offer of free watermelon. Being a mangrove swamp, there are also lots of oysters that attach themselves to the mangrove roots. These, it seems, are harvested not just for food (actually, they are quite hard to use for that, because of how they grow all clumped together), but mostly for their shells which, being calcium carbonate, can be burned and then slaked (watered) to turn into ‘slaked lime’ – calcium hydroxide – from which one can make cement. Which is exactly what the locals do. So one sees large piles of oyster shells all around the village, waiting for processing. 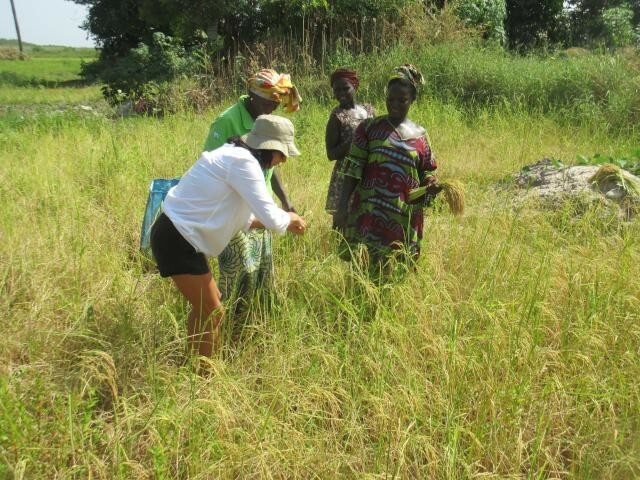 Ceu, being herself, was quick to join in with some women who were harvesting rice. This they did, not with a scythe or sickle, but with a small kitchen knife, with which they would cut off a few stems of rice at a time. Once they had a handful, they put it in a basket. Sunday was spent sorting out internet for the phone. 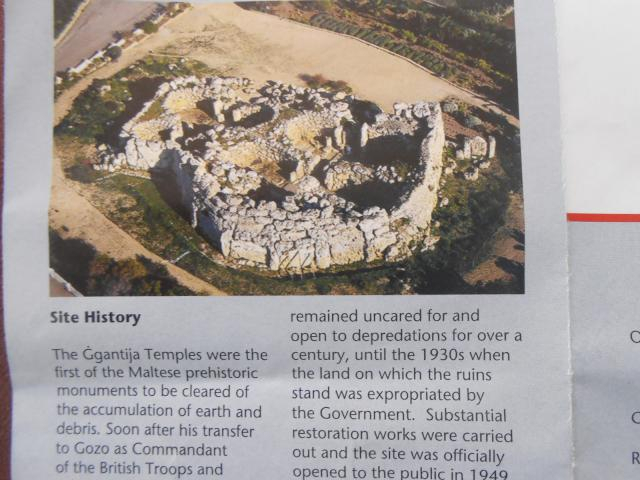 Having been told it was just a couple of kilometers from Lamin Lodge we decided to walk. 5 or 6 Km later, very hot and dusty, we arrived at the outer entrance to the airport grounds. There we met a very pleasant security policeman who had nothing better to do than to drive us up to the airport itself where we were able to sort out our internet (see our tips on Gambia). For the tourist the main attraction are the beaches just north of the city. So on Monday, after getting our cruising permit, we hit the beaches. How nice it was to have a swim in the sea again! It is not the Caribbean, but we had some great body surfing. A lot of fun. And so on Tuesday we headed up river. When we left Banjul we had company. There was a French yacht, with Mum, Dad and teenage daughter who were also going up the river at the same time as us. This was the only yacht we ever saw on the river. As they were travelling at the same time as us, we kept meeting up with them at various stops, and would then compare notes on the wildlife we had seen. Our first stop on the river was just 15 miles from the start. James Island, now called Kunta Kinteh Island after the character in the book and movie Roots by Alex Haley. Like Goree Island by Dakar, this was a staging post for slaves being shipped to America. 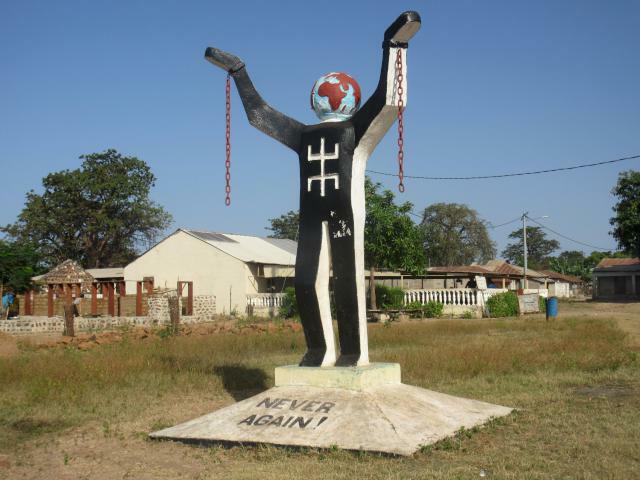 Kunta Kinteh was a local who was captured and enslaved. Now the island is just a ruin, and the nearby town is also pretty underwhelming, though there is a Spanish lady there who is trying to help get it built up more so as to attract tourists. 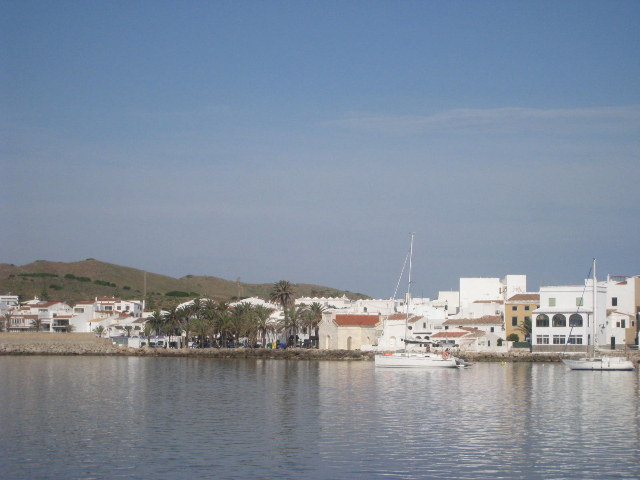 We anchored outside that town, while the French anchored off the island. Before and after James Island we were treated to some spectacular displays by dolphins. These were hunchback dolphins, and they would leap into the air like we had never seen wild dolphins do before. And so many of them! 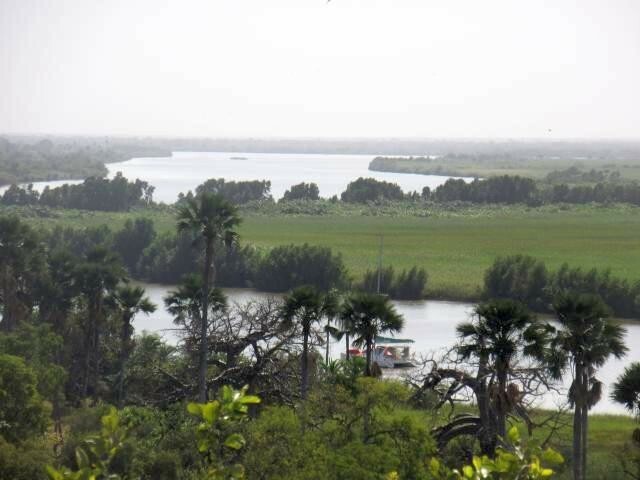 The Gambia River is huge – over a mile wide for much of its cruising length. But it is still a river, so it is a matter of catching the tide going in the right direction, and then anchoring until the next tide. In this way we meandered about 140 nautical miles up the river, going gradually from saltwater to freshwater – but still brown mud all the way. Several times we went in the dinghy to say hello to the fishermen. All were friendly. 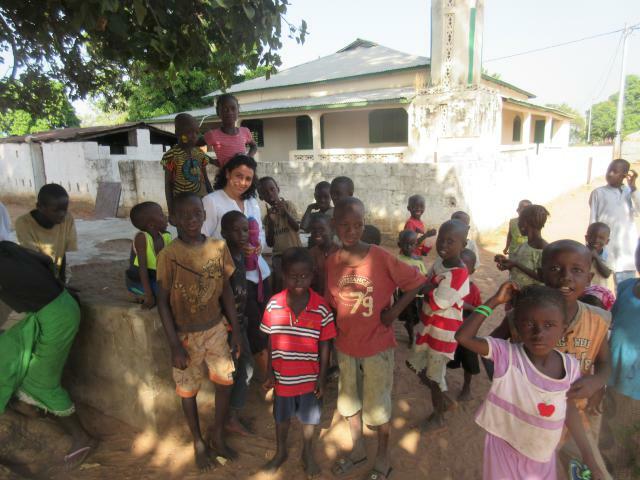 We gave them a bottle of cold water and made friends for life. 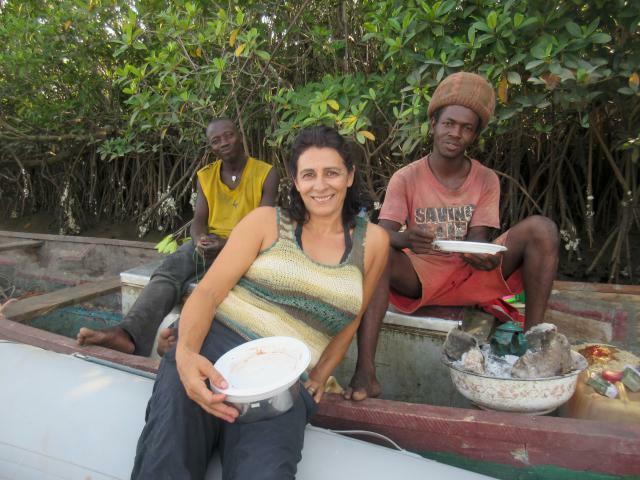 One boat invited us to join them for lunch, which was spaghetti being cooked in a pot on a charcoal fire in their wooden canoe. We contributed some bottled sauce that we had, and also some pasta salad. And gave them a spark plug, as theirs was not working. Immediately one of the guys installed it and got his outboard running again. A different boat gave us some fresh caught fish. Their fishing tactic is to string fishing nets all along the side of the river, close to the mangrove. This seems to work, as we saw many small (8 inch) fish caught up in the nets. I don’t know how the fish manage to find each other for feed, as visibility in the muddy water is a matter of inches only. We also visited some of the villages. Gambian villages are RURAL. They do, now, have piped clean water coming to a village standpipe, around which all the women gather to fill up their plastic jerry cans. Apart from that, they have very little. In the dry season it seems they mostly eat rice, ground peanuts, and fish. Though we did see plenty of goats and chickens, very few of the villages actually had any eggs for sale. And much to our surprise, fresh fruit and vegetables were also almost impossible to get, though we did find some potatoes and aubergines. Visiting a village is a Big Event for the locals. 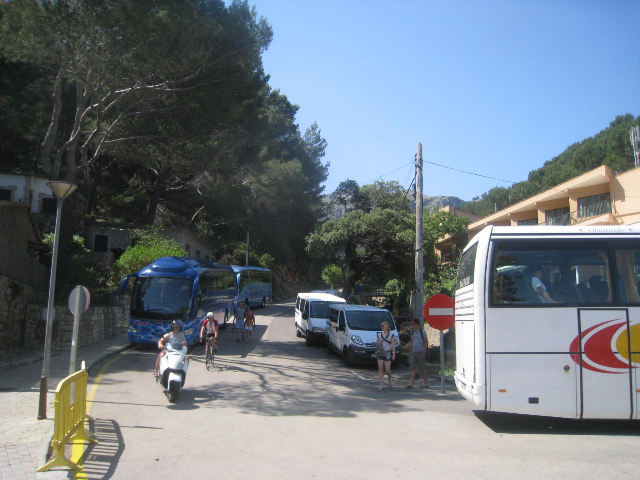 The children are particularly excited and will mob around you, clamouring to ask your name and hold your hand. The poverty is obvious. People have nothing. But they are cheerful and friendly. 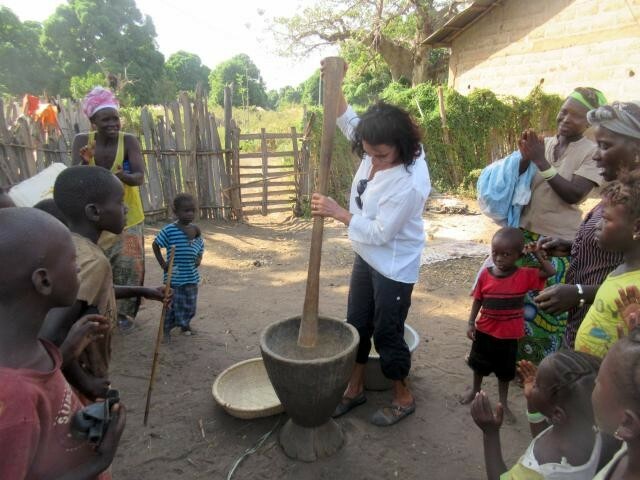 Daily living is clearly hard work – pounding rice, collecting water, farming and fishing. But when the work is done, they sit about the village and socialise with each other. It reminds me of the parable about the peasant fisherman who is encouraged to turn his small fishing activities into a growing and big business – so that ultimately he can retire, and then can sit around and perhaps do a bit of fishing. “isn’t that what I am doing right now?” was his response. 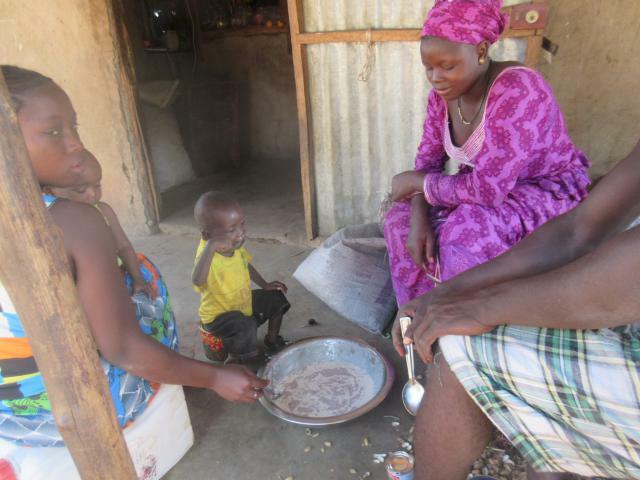 A rice and peanut porridge is a common meal – and very tasty too! And so we must be careful not to impose our western ideas of success and happiness on these people. What we noticed was that in the villages that are rarely visited the people were all welcoming and friendly. But in the more visited villages they would be asking for gifts and handouts. Sure, they were still friendly. But now one starts to suspect their motives when they come to greet you. The extreme result of this was, of course, Dakar. A popular request from the boys was for a football. They all want to be Christiano Ronaldo. We did buy two balls in one of the larger towns, Kantaur, and we then took this, plus some spare lines as skipping ropes, plus a few school supplies, and gave them to the teacher at one small village. He will use them as incentives to get the children to attend. Most of the lower stretch of the river is mangrove, so a bit monotonous on the scenery. But from Elephant Island up it started the change – as did the insects who were trying to bite us. 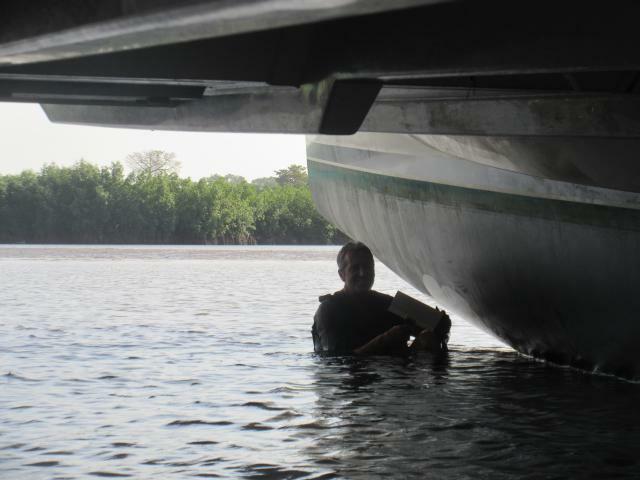 At Kudang we anchored right outside the village – and quickly regretted it. We were surrounded by children in canoes and even swimming. Some of the little ones could barely swim and had to hang on to our boat when they got there. One teenager just calmly climbed on board and started to walk into our cockpit! We were so overwhelmed that we picked up the anchor, moved on half a mile, and anchored again. We never visited that village again. Each day we traveled about 20 miles, hitching a ride with the tide while it ran, and anchoring when it stopped. Sometimes this would mean a morning trip and other times we traveled in the evening. The former was nicer, as it allowed us to stop in the afternoon and still enjoy the day before the bugs came out in the evening. The evenings were a challenge. The bugs were so plentiful that we tried multiple strategies to try to escape them. 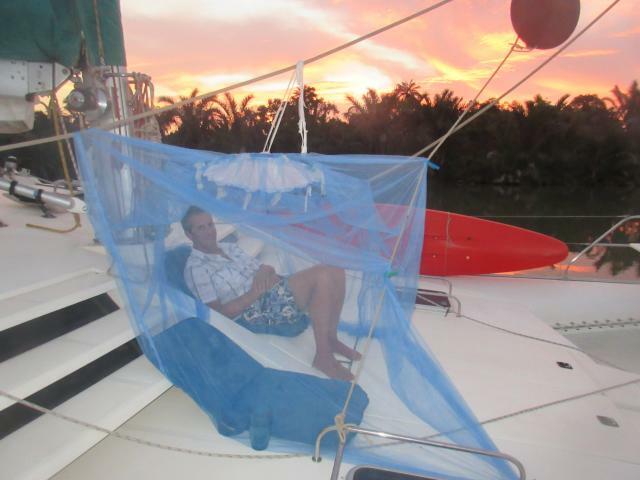 We set up a a mosquito net ‘tent’ on our foredeck, and would crawl under this at sunset – even eating our supper there a couple of times. But still the tiny insects can get through the netting. If there was a breeze it was better. Most of the time, though, it was flat, flat calm. So still. In the lower stretches there were no sounds. Just a red sunset, starry sky, and bugs. Up river was more noise – cicadas and other insects making noises. So many birds chattering away. And Hippos grunting like pigs. At Deer Island we started to see monkeys. There were at least three different varieties that we saw. Not easy to spot them, up in the trees. So we decided we would go ashore, as there was a nice accessible beach there,and see if we could see more inland. As it turns out, we had a nice walk through the savanna and brush, but we saw no more monkeys. Coming back to the boat, however, we did meet some fishermen who were extracting fish from their nets. So we gave them some cold water, and they gave us some fish that we then ate for supper. We were still hoping to see hippos. The fishermen told us there were lots around. 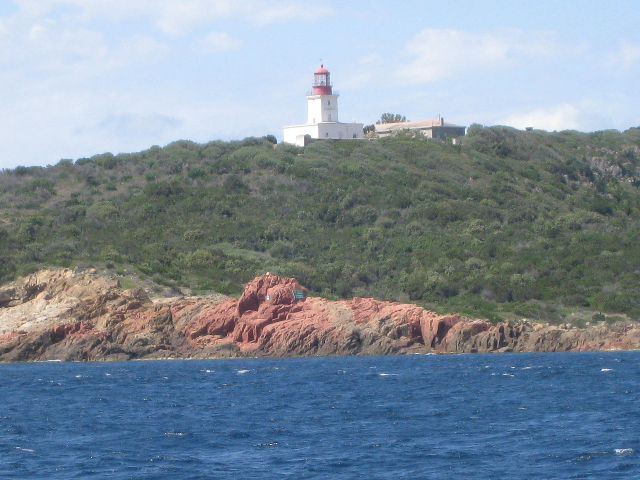 The French said they had seen 3 just by Deer Island. But so far we had seen none. 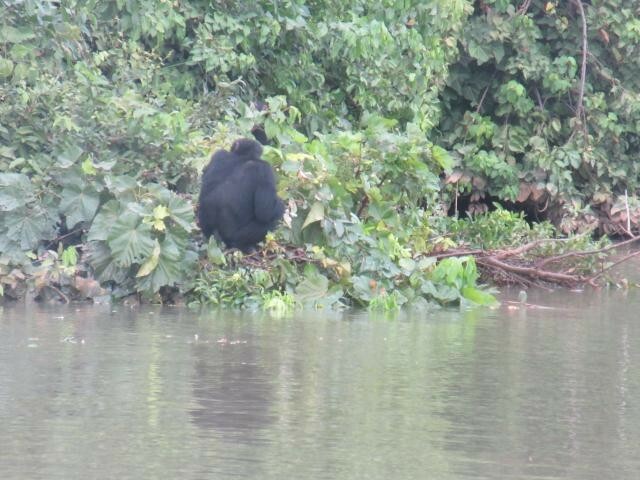 Finally, as we were approaching Baboon Island we saw one, who quickly walked into the river and submerged. Yet at night at anchor just up from Baboon island we heard them all around us. There would be grunting, and loud splashy exhalations. We shined a flashlight into the darkness, but we never saw any eyes reflecting back at us. The Baboon Islands are a national park. No anchoring is allowed within, and one is required to go no closer to the island than midstream. We arrived late in the day on the Sunday and motored with the tide past the islands hoping to see chimpanzees. 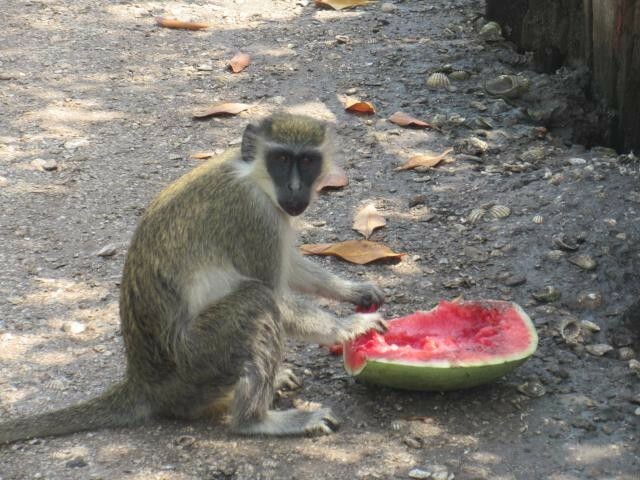 We did see a few monkeys – red colobus and baboons – but no luck with the chimps. We anchored just past the last island. In the morning the park rangers came out to see us. 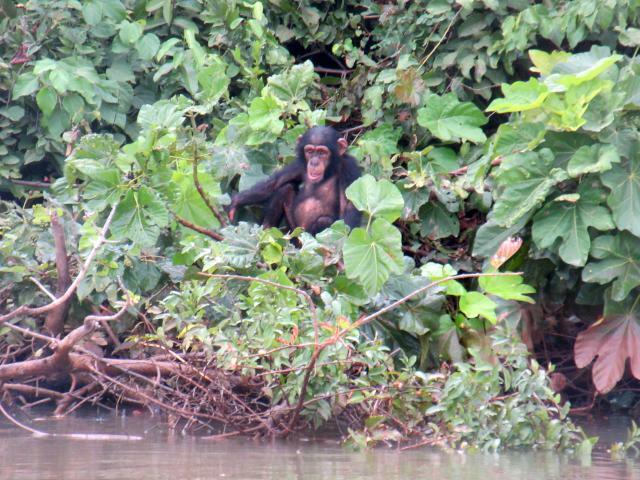 We had a pleasant chat, and asked them about the Lodge in which, we had heard, one could stay and get to see the chimps. And all for only 100 pounds, all inclusive, for a couple. The French family had, it seems, such a booking. That sounded cheap compared to the cost of seeing chimps in Uganda. And since it was Ceu’s birthday, we wanted to know how to arrange this. Alas, the rangers said it all had to be done online – and since we had no internet at the time, that ruled out that option. And then, pretty much as a last thought, they told us that one could gain ‘entrance to the park’ for 150 Dalassi (3 euros) each. Further discussion, including a lengthy conversation between the rangers in their local language, resulted in a very cool outcome. For just 700 Dalassi they would take us in their boat, right up to the edge of the island, and we would find the chimpanzees. They would make Ceu’s day for her. At 1pm they came over to Life Part 2 to pick us up, and we went chimp hunting. 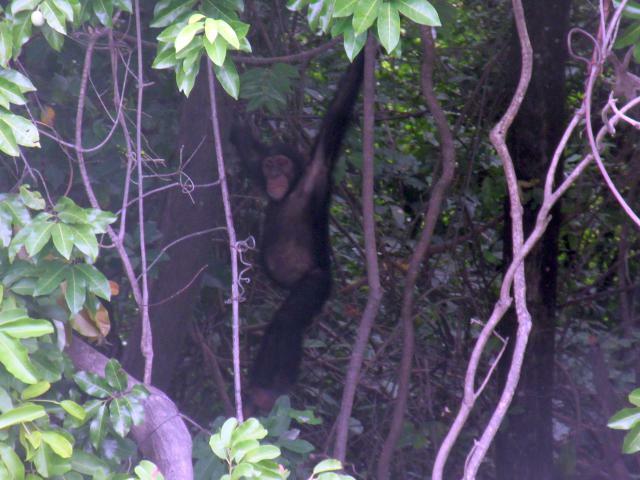 One of the guides would stand in the bow and call out in Chimpanzee, inviting the chimps to come and visit us. To no avail. No chimps, no baboons, no colobus, no hippos, nothing. They were sad. We were sad. But such is wildlife. Then, after another long conversation in their language, they had a solution. At 3:30pm we should take our dinghy over to their camp. We could then do a short walk through the woods while we waited for 4pm. 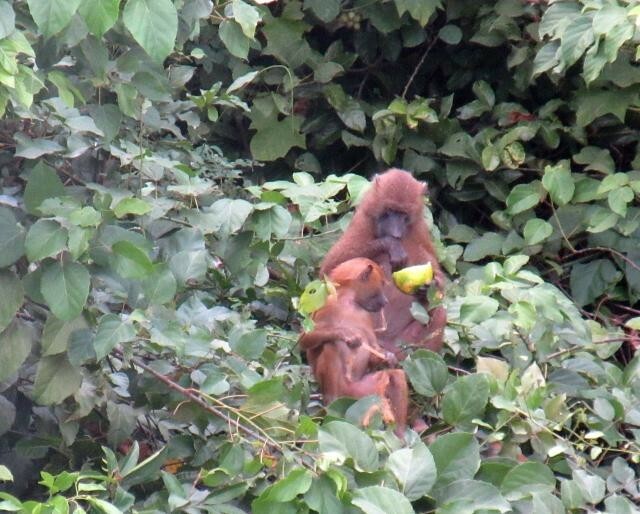 At 4pm the senior rangers from the main camp set out with a pile of fruit. Every day at that time they would go to the Island, and they would throw fruit ashore. Needless to say, the chimps and baboons were very happy with this arrangement, and would come down to collect the offerings. This allowed the rangers to count and observe the health of the animals. We, with our private rangers, would tag along behind, at a good distance, and watch the show. Once the feeding rangers had moved on, we were taken much closer in. And there they were. We stared at them. They stared at us. Then they turned their backs to us, and continued to eat their fruit. The baboons were less sanguine. They would shake the branches at us. So cool. The rangers were happy that we got to see the chimps. Ceu was happy on her birthday. Several times the chimps would turn their backs to us while eating. Quite deliberate. That then, was the pinnacle of our river trip. We decided to go no farther, as we wanted to leave a few days for visiting the Casamance before we had to head off to Cabo Verde to meet with my son Ben’s arrival. The trip down the river was quicker. At times we were moving at 7.5 kts as we had the combination of the river flow added to the spring ebb tides. 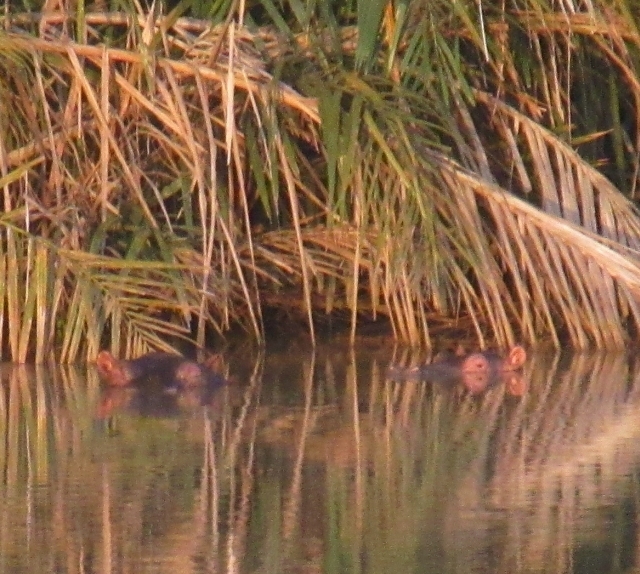 Shortly after leaving Baboon island we say a bunch of hippos swimming across the river. They would poke their heads above the water. Let out a large breath, and then duck underneath again. They could stay below for a long time. No wonder we could never see them. 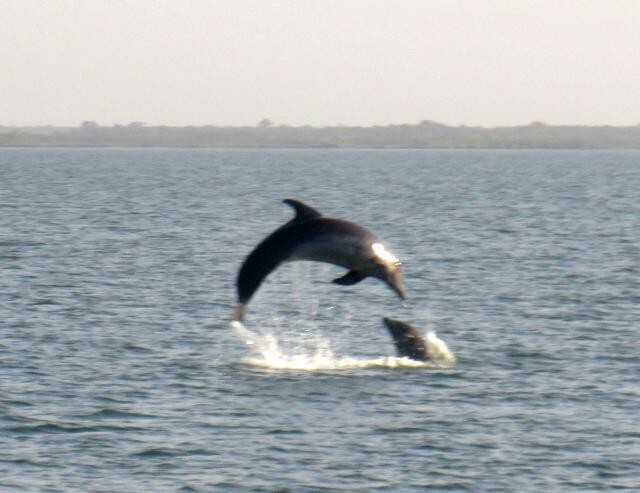 Before long we were back with the dolphins as we approached James Island and then the Banjul estuary. 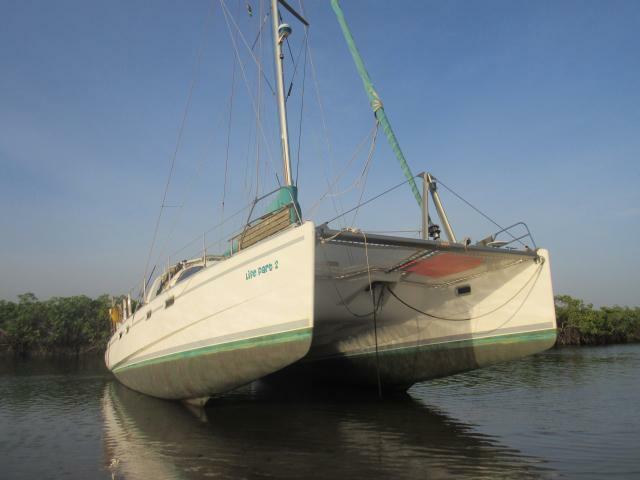 We made our way back up to Lamin Lodge, and the next day we beached Life Part 2 on a sandbank so that we could scrub down and reactivate our coppercoating. Actually we were impressed to see very little growth on the bottom, so that is good news. Just a bit of slime that was easy to scrape and rub off. It turned out that we didn’t really have enough time for Casamance, so we went to the beach again, instead. The beaches of Senegambia, Banjul. Look who’s 50. Happy Birthday! And then it was time to go to Cape Verde Islands. What wonderful adventures you are having. Love , Merry Christmas and Happy New Year. Our house is all decorated for Christmas. We have two big real Christmas trees, but unfortunately they don’t smell. The trade-off is that they don@ shed their needles – but I Prefer the old fashioned fragrant trees, even if they shed – but then I am not vacuuming.